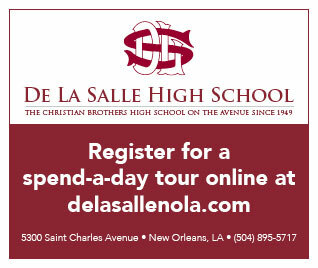 THIBODAUX, La. – Following a three hour and 19 minute lightning delay, the No. 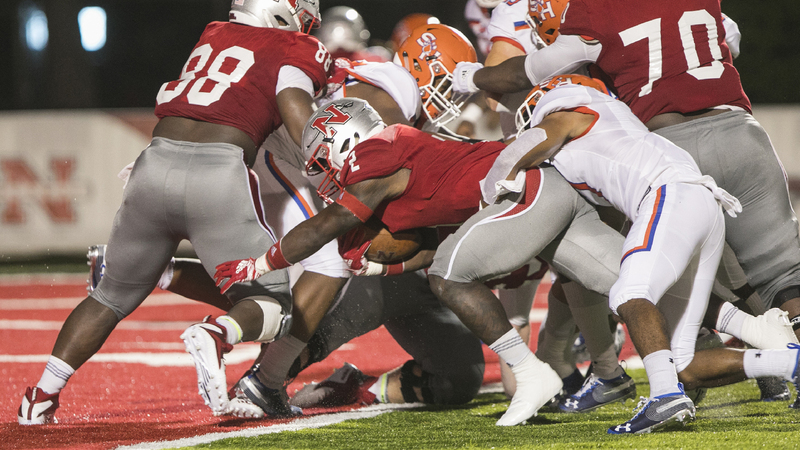 18 Nicholls State University football team put together a solid effort in all three phases in its home opener against No. 11 Sam Houston State and the Colonels picked up a 27-7 victory Saturday night at Manning Field at John L. Guidry Stadium. Nicholls (2-2, 1-1 SLC) trailed 7-3 after the first quarter but went on to shutdown the Bearkats (1-2, 0-1 SLC) the rest of the way. Offensively, the Colonels grinded it out with their rushing attack, piling up 248 yards on 54 carries. Sam Houston, which had won the last 11 meetings against Nicholls dating back to 2005, was not able to get its ground game going, rushing for 53 yards on 30 totes. Chase Fourcade was efficient in leading the offense, completing 15 of 23 passes for 197 and a touchdown. His TD toss came in the second quarter to Damion Jeanpiere, Jr., who moved up to fifth in all-time receiving yards. The high school teammates connected on a 12-yard slant right before the break that put Nicholls ahead 10-7. In the second half, Lorran Fonseca added a field goal for a 13-7 advantage. Before the end of the quarter, the Bearkats pieced together a 10-play drive that went for 86 yard, but Ahmani Martin made the play of the game with a timely interception. Through three games, Nicholls had not recorded a pick before Darren Evans secured one earlier in the quarter. Then on 2nd-and-goal from the 3, Bearkat quarterback Mike Dare threw a pass on an out route near the goal line, and Martin dove in front of the receiver and snagged the pick at the 1. Fourcade then led Nicholls on a touchdown drive, helped by his 24-yard scamper down the sideline. The drive ended on a Dontrell Taylor 6-yard touchdown run for a 20-7 advantage. Taylor (68 yards rushing), Kyran Irvin (73 yards) and Kendall Bussey (46 yards) each had at least 13 carries. Fourcade added 60 yards on the ground to give Nicholls a 4.6 average in the win. The final touchdown of the game was by Bussey on a 2-yard rush. It was set up via a fourth-down try from Sam Houston at their own 2. Evan Veron, who matched his career best with two sacks, earned his second to force a 4th-and-16 from the Bearkat 2. With only 2:55 remaining in the contest, the Kats threw a ball down the middle with hopes of extending the possession, but Martin broke it up to force the turnover-on-downs. Bussey scored his first touchdown in Thibodaux on the next play, making the final 27-7. Led by Veron and Kenny Dotson with two sacks each, the defense had another stellar performance against a premier opponent. Laryon James finished with a career-high 11 tackles, while Ronald Ollie added two tackles for loss with a sack. Dai’Jean Dixon led the receivers with 62 yards on three catches, and Arron McKenney caught his first three career passes, going for 51 yards. McKenney had a highlight catch for 22 yards in the third quarter, but the drive stalled inside the 10 after a fumble by Bussey at the Bearkat 11 – one of the few mistakes for the Colonels on the night. The specialists had one as well with a blocked field goal, but Fonseca was good from 35 and 22 yards. Joel Dullary set the tone for the night with a 37-yard kick return to start the game. Winston Jones only punted twice, but both were downed inside the 10. Dare finished 18 of 24 for 214 yards and had a touchdown pass to Davion Davis. Nathan Stewart led all players with 113 yards on eight receptions. Nicholls will play at home again this Saturday (Sept. 29) for Family Day. Kickoff against Lamar is scheduled for 2:30 p.m. and the game will air on Eleven Sports.